ANN BUDGE acclaimed Robbie Neilson and Stevie Crawford as a key part of Hearts’ future after the management team signed new contracts. Head coach Neilson and his assistant Crawford agreed new deals until 2018 as reward for the club’s on-field prowess over the last two years. Hearts are third in the Ladbrokes Premiership and challenging for the Europa League qualifying rounds less than two years since emerging from administration. Neilson and Crawford, along with director of football Craig Levein, have overseen rapid progress at Tynecastle since their arrival in May 2014. 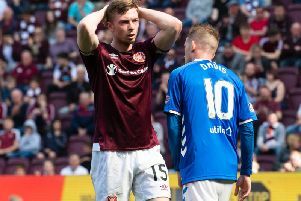 Neilson meanwhile, says Jordan McGhee will remain a key figure at Hearts from now until the end of the season before deciding where his future lies. Neilson explained today that the teenager can continue to play regularly, however the prospect of a move to Middlesbrough in the summer is still alive. A loan deal at Boro collapsed late on transfer deadline day at the start of the month and could be resurrected in time for next season. McGhee is keen to test himself in England and had his bags packed ready to head to Teesside until the deal fell through, with paperwork not completed on time. He may choose to try again at the end of the season but Hearts want him to develop more in Scotland first. A red card at Tannadice last week means he is suspended for tomorrow’s Ladbrokes Premiership match with Kilmarnock at Tynecastle. Neilson will reorganise his defence, with Callum Paterson available again, but stressed that McGhee still has a big part to play. “He’s a main part of our team. We’ve got Jordan, John Souttar, Alim Ozturk, Igor Rossi and Blazej Augustyn. They’re our centre-halves and it’s a strong group there,” said Neilson. “I see Jordan as a guy who is going to develop here. Yes, there was interest from Middlesbrough and he was keen to go down because he wants to try it down there, but it fell through at the last minute. Neilson confirmed Hearts’ interest in Raith Rovers teenager Sean Mackie, who has decided to join Hibs for an initial £25,000 after passing a medical. Today’s match sees new Kilmarnock manager Lee Clark in charge for his first away match. His brief is to steer the Ayrshire club away from the Premiership’s relegation zone, whilst Hearts are seeking to atone after two successive defeats against Hibs and Dundee United. “It’s been a difficult week but we had a difficult time near the start of the season and we managed to come through it,” Neilson pointed out. “We just do the exact same stuff and stay consistent. We lost the Hamilton game and lost the next two but you have these ups and downs and you just try to get going again as quickly as you can. As a harsh Scottish winter begins to subside, the Tynecastle pitch is in good condition and Neilson hopes to see more attractive football played by all teams over the coming weeks. “Tynie is good. We’ve had a couple of call-offs but the weather has been terrible. This time of year is always a difficult period for players. You look at the games and the standard comes down.